Taste test: These were good conventional potato chips with a nice potato taste and without a whole lot of salt. This tiny 1-oz. bag was chock full of unbroken chips, including an impressively large one near the top, and it cost just a quarter. Many chip companies sell bags with half as many chips at twice the price or more. 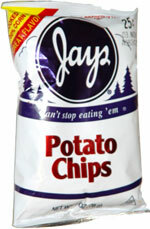 Smell test: Regular potato chips smell. OK.